Backing up Zionist Union co-chair Yitzhak Herzog, Tzipi Livni asserts party has no plans whatsoever to join Netanyahu government. 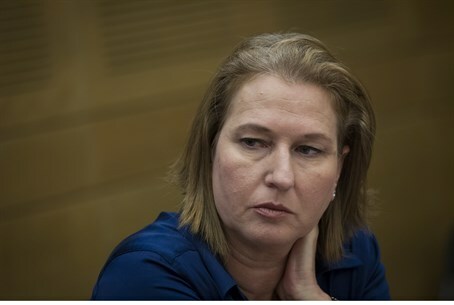 MK Tzipi Livni was quick to back up her Zionist Union co-chair Yitzhak Herzog on Saturday night, insisting the party has no interest in being part of Prime Minister Binyamin Netanyahu's government. "I am not joining this government. It is bad and dangerous for Israel," Herzog told Channel 2 News on Thursday, adding, "I suggest that Netanyahu and his partners fill all the ministerial portfolios that, according to rumors, are waiting for me." Livni agreed, calling it Zionist Union's "mission" to sit in the Opposition, before moving on to issue yet another attack on Netanyahu. In an interview with Channel 2's "Meet the Press," Livi stressed she would do absolutely nothing to strengthen the Prime Minister and his "wait until the end of elections to decide which parties to lure" tactics. "The campaign made abundantly clear that we're speaking about two different viewpoints," she added. Continuing her assault on Netanyahu, Livni asserted he "propounds a sense of Israel's national victimhood as well as his own. He bases his entire viewpoint on [the assumption] that the whole world is against us." "On a personal level," Livni continued, "he came out against the media and the court because they harassed him." The Zionist Union co-chair also addressed internal struggles within the party, particularly complaints of unwanted "two-headed leadership" from MK Shelly Yechimovich. "I'm not interested in political mudslinging. It's important to talk about the dowry - we started the campaign when Shelly said Labor would finish with less than ten mandates. Together, we got to 24. To insult this achievement is a shame." "It's very important not to shoot the messenger," Livni continued. "Our mission is to be in the Opposition. We built the idea of the Zionist Union as struggling for a shared path. There are differences of opinions, but that's in the margins." "We'll see how we continue on a shared path. A large body a wide wingspan can replace the government," she added.